When my old Quantum Turbo Z battery died a few weeks ago I was a little bit annoyed. I hadn’t used it that much and I wasn’t that happy about getting another one. I had read several reviews of a battery pack available in the UK under several different brand names including Godox and Lencarta and I decided to investigate. The unit was available at a really good price from Calumet under their Genesis brand and as a member of The BPPA I was able to get a decent discount from the already low price of £125.00 inc VAT. 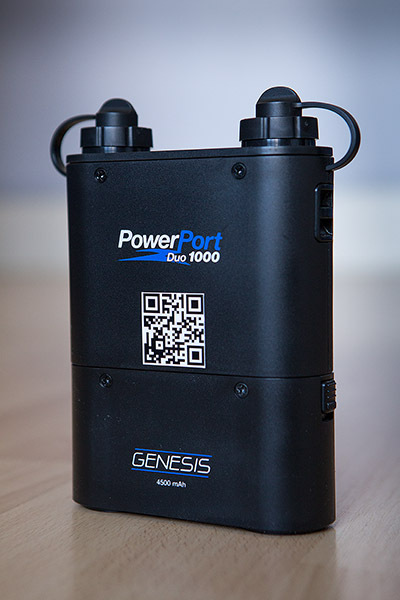 At that price I thought that it was worth a shot and so I extravagantly rang Calumet from Paris where I was working at the time and got them to send the pack and a single Canon Speedlite cable so that my Genesis PowerPort Duo 1000 would be there waiting for me when I got home. My first reaction was that it was a lot lighter than the Quantum, roughly the same size in terms of bulk and had two ports. It didn’t appear to be quite as well made and the covers on the two ports were feeling more than a little “plasticky” when I had a look at them. I’m never rough with my gear and so this isn’t always a problem so I stuck the battery on charge ready for a job the following day which was going to involve quite a bit of bounced flash. It charged really quickly (to be fair, it arrived at 2/3rds full anyway) and I gave it a few tests just to make sure that it was functioning and that my decision to not bother reading the instructions wasn’t a huge mistake. All seemed well and it was recycling a Canon 580exII on full power output in a fraction over a second – every bit as quick as my Quantum Turbo Z.
I shot the job the next day and it performed flawlessly. Every frame was lit and the Speedlite didn’t get remotely warm (a danger with the Turbo Z). My investment was looking to be a decent one. There was another photographer on the job with a differently branded version of the same battery and he had a short cable that allowed you to charge any USB chargeable device from the pack. I had a play, it worked and I ordered one using Amazon Prime on my phone there and then. This appears to be one of the great photo-bargains. I’ll let you know if it fails to pass the durability test over the next twelve months – which is the only potential fly in the ointment. That’s why I went for the Calumet branded one – they have shops where I can go and take it back if it does fail. I thought Calumet had packed up, so I learned something. Did you do your shoot with just a Speedlight – or did you also have a bigger kit? That first shoot was done with a Speedlite on camera bounced off of various walls and ceilings around the place. It’s not an ideal way to work but on some fast moving editorial and PR jobs it is the only real option. I quite often use bounced flash in that way with the ISO on the camera ramped up to somewhere between 640 and 1250 ISO yo can get some very nice light with lots of flexibility in how you work too. I bought two of the Godox models (single port, one black, one bright green so I could differentiate them). I’ve found the black one to be very reliable, but the green one doesn’t seem to hold a charge so well and it’s not that old. Problem is I think I’m well beyond the warranty period. On the other hand, they were selling for about £90 at the time so not a massive investment. I also bought the USB cable so after a job I can use any spare juice to charge my phone when I’m on the train back from London. It’s worth knowing though that you can get old Quantum packs re-celled. I have an old one which I keep thinking I’ll get done. I imagine the cost to be about £40. I bought the Lencarta version of this with the Atom 180 flash unit. Calumet sell these too as Genesis kits. Mine too has worked flawlessly, and I really like the quality of the light from them. The reflector and bulb placement is the same as on my old lumedynes and I always loved the light quality that lumedynes gave, much more so than the Elinchrom Ranger Quadra kit I briefly had. Unlike you, Neil, I really hated them. No coiled leads, green LED you couldn’t see in daylight, heavy batteries and bad life from the non original non lithium batteries. Complex menu’s and a light quality that was not a patch on my old Lummy’s. Because of the thyristor circuitry in the Atom/Genesis flashes, the power packs last longer than a Duracell bunny and the spare batteries and tubes are a steal at £55 and £40 respectively. Lencarta also do a really good brolley style beauty dish which converts into a small softbox. I also have a lead for the Olympus flashgun I use with the micro 4/3 kit I now use. Flaghead photographic do a very good small bracket for attaching these power packs to a lighting stand for about £12 or £15. I got one of these yesterday at Calumet in London. It was silly cheap because of their “Black Monday” (?) Discount. Nice and light weight too…with the supplied padded shoulder strap you’d hardly know it was there!